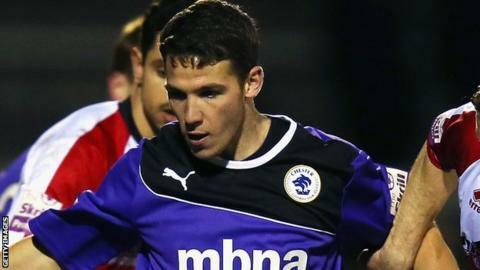 John Rooney scored a stunning free-kick as Chester beat Wrexham in the National League's cross-border derby. On-loan James Roberts had shot wide before Chester deservedly went ahead through Rooney's 25-yard free-kick. Dominic Vose levelled from the penalty spot after Blaine Hudson was fouled only for Tom Shaw to restore the home side's lead. Substitute Kane Richards' header made it 3-1 before Connor Jennings pulled a goal back in stoppage time. "We were second best from start to finish. We had a little spell after they scored when we had a couple of chances but other than that we were second best. "We didn't get ourselves on the front foot like they did and never got going. "That's not a performance that's going to get us where we want to get to." Match ends, Chester FC 3, Wrexham 2. Second Half ends, Chester FC 3, Wrexham 2. Rob Evans (Wrexham) is shown the yellow card for a bad foul. Jon Worsnop (Chester FC) is shown the yellow card for a bad foul. Goal! Chester FC 3, Wrexham 2. Connor Jennings (Wrexham) right footed shot from the right side of the box to the bottom right corner. Substitution, Chester FC. Jordan Chapell replaces James Roberts. Substitution, Wrexham. Mark Carrington replaces Joe Quigley. Goal! Chester FC 3, Wrexham 1. Kane Richards (Chester FC) header from the left side of the box to the bottom left corner. Attempt missed. Manny Smith (Wrexham) header from the left side of the box is too high. Substitution, Wrexham. Wes York replaces Jon Nolan. Substitution, Wrexham. Adam Smith replaces Adriano Moke. Ross Hannah (Chester FC) is shown the yellow card for a bad foul. Goal! Chester FC 2, Wrexham 1. Tom Shaw (Chester FC) right footed shot from the right side of the box to the bottom right corner. Assisted by John Rooney. Attempt saved. Ross Hannah (Chester FC) right footed shot from the left side of the box is saved. Assisted by John Rooney. Attempt missed. James Roberts (Chester FC) right footed shot from outside the box misses to the right. Jon Nolan (Wrexham) is shown the yellow card for a bad foul. James Roberts (Chester FC) wins a free kick. Foul by James Roberts (Chester FC). Substitution, Chester FC. Kane Richards replaces Craig Hobson.